Thanks for all the compliments on the Must Have!! Took so long to get motivated to finish it, but now that it’s done I’m rather in love with it once again. Now that I’ve finished a couple of languishing projects, time for some new ones! Here’s the start of the tall socks, in Elann’s Esprit print. 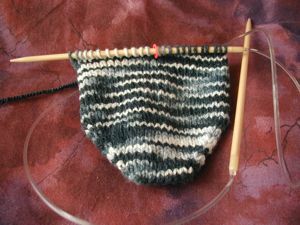 I’m going toe up on 48 stitches, and I hope to do a short row heel, even though I haven’t found instructions for 48 stitches. Oh well, I’ll wing it – I mean, it’s just short rowing until there are 8-10 stitches in the middle, then picking up the wrapped stitches, right? And what’s this? 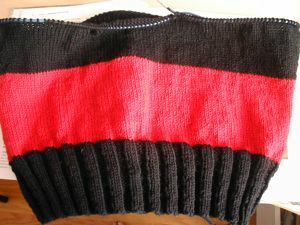 The start of a punk-style vest, in Patons Classic Merino (I’m trying to use up what I have). The red isn’t quite as eye-searing, but it’s pretty bright. If it turns out that I don’t like wearing a vest, well, I can always knit sleeves and make it a full sweater. For even more stockinette in the round (boring, but soothing and non-taxing) I think I’m going to rip what I’ve done of Mariah (no offense, Jodi!) and make a retro-prep pullover instead. The cables just aren’t working too well in this yarn (elann’s highland wool) and I’m not sure that I want to knit the sweater anymore. I haven’t left the house in three days – at least I’ve been pretty productive, with the knitting AND the school! All that stockinette in the round is good for knitting while reading.